are too silly or innane to post or I just am too lazy to do it! I can't wait until we move into a place that feels like "ours"
junk which is starting to fall apart after probably 10-15 years of use. living there together for about another year. blog and he came in and was like "Kawaii!! I want us to have one too! the day we want to have it done officially. For several reasons..
the dead will be pulling his friends to the grave with him etc etc..
truth to it then I'll gladly accept the Taian good luck. and apply for the visa when I get back from my trip to America in March. I really feel like that year is a shift in to “adult” responsible life. home in a year or two like I thought I was. 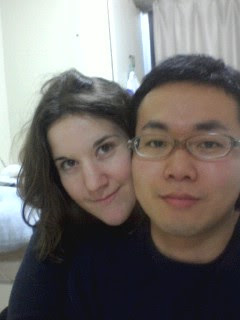 next year we are celebrating and planning for our new life in Niigata. Cheers to all those for 2008.
two weeks but he seems very into it and I think it been going well. its very cute. I love him!! “ummmmmaiiiii” that Ryohei (usually) gives me after I serve him dinner. It makes me happy to have a little family..
he gets situated the sooner we can get settled. Kansai area for more than another year and a half to two years. well on that end as well. Anyways.. I like to be somewhat planned ahead. blankets to his side of the bed last night! Grr! a frightening and.. expensive peak. would classify as learning, test taking, and kanji oriented action game. far so today I will review 2 of the ones that I have in my collection. 7 8 and 9 being junior high school and high school kanji. was 旗（hata) flag that I just kept getting wrong over and over again..
half of the kanji that I know now. some of those obscure kanji they use for fruits/veggies etc. the earlier levels. I love this software and highly highly reccomend it. do it over and over again and no wasting paper!! see it for a better price. covers all of the kanji in the first one and another 900! discounted for about 3200 yen at an electronics store and have been very much enjoying it. The game has 3 sections. The game has hiragana, katakana, grades 1 – 6, jr. high first half, jr.
1-100 scale as to its beauty and overal following of the stroke order. and ( progress) explained in Japanese. Helpful for expanding vocab. incorrectly stroke orderwise you fail! Not a bad system! prove as a good way of marking your progress. although i admit being asked every 10 hiragana/kanakana was annoying. Besides that theres no really complaints that I have besides that. depends what you want to get out of the game! catagory. In particular my ningen kankei is not so great at this point. So.. I think I messed up at work today. Since my work pays for some of my housing and now that Ryohei had moved in with me, I thought it would only be right to bring him to my office to at least introduce him to my supervisor. Anyways, my office is very laidback and relaxed so I thought it would not be a problem. go in understand the Japanese way. I’m feeling pretty embarrased and that I chotto shiturei shimashita. after we got there and continued for 4 days or so coating the scenery around us in white goodness. It was so pretty and nice to lazily flop under the kotatsu with some apples and crackers and watch the snow fall. big hug and kept saying Sara ga Daisuki! (I love Sara) I think that maybe she was a little drunk?? I have never been hugged by a Japanese person that was under 25 years old either so it was a little ackward, but I smiled and hugged back. I think that actually the relative Ryohei loves the most is his grandma since him mom worked when he was born and she was pretty much the one who raised him for his first 2-3 years. Actually she refers to him as the kid that she raised. So, I think that fact that she is so “enamored” with me makes him happy. Anyways, we did Hatsumode at the Shrine near his house which was fun. Its just a tiny shrine for his neighborhood so it wasnt too crowded. Just perfect! After that we went to see his friend from elementary school who ended up having a “deki-kon”and now has a 4 month old boy. Gah.. he was so cute!! Ryohei kept playing with him and hugging him and even kissed him. And I was just sitting there praying not to let the instincts to jump him and make our own baby right there overflow me. So moving in was not soo bad! Ryohei sent me wayyyy more stuff than he needed to, but weve managed to pretty much make it all fit one way or another. He also started his school yesterday and will be studying like a crazy person for the next 6-7 months until his test. As for me, its same old really. Go to work, come home, make dinner, watch tv etc.. but just having him be there is such a comforting presence! Of course its only the first week so we’ll see how things are going in a month or two. Both of us are more lovers than fighters so hopefully it will be smooth sailing.